Earlier this month, the blind human rights activist lawyer Chen Guangcheng escaped from house arrest and sought asylum in the US Embassy "Chinese Dissident is Released From Embassy, Causing Turmoil for U.S.", NYT, 5/2/12). In a previous incident in February, Wang Lijun, the police official, who was once an ally of the now deposed Bo Xilai sought refuge in the American consulate in Chengdu ("Frenzied Hours for U.S. on Fate of a Chinese Insider," NYT, 4/17/12). Both of these incidents were politically embarrassing to the United States and China, at a time when both were seeking to work out conflicts. Hillary Clinton had been in Peking ("Chinese activist Chen Guangcheng seeks meeting with Hillary Clinton," The Guardian 5/4/12) for bilateral talks when the whole Chen Guangcheng incident broke out. 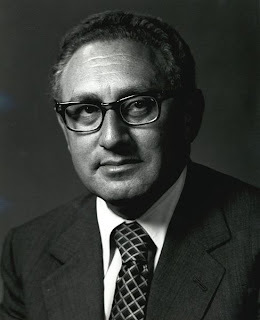 Henry Kissinger the quondam realpolitician (who oxymoronically also received the Nobel Peace Prize ) and former Secretary of State in the Nixon and Ford administrations has written a piece in the March/April Foreign Affairs, “The Future of U.S.-Chinese Relations” which is a handbook for future conflict resolution with the world’s second largest economy. In the section titled “The Risks of Rhetoric,” Kissinger thus writes, “The American debate, on both sides of the political divide, often describes China as a ‘rising power’ that will need to ‘mature’ and learn how to exercise responsibility on the world stage. China, however, sees itself not as a rising power but as a returning one, predominant in its region for two millennia and temporarily displaced by colonial exploiters taking advantage of Chinese domestic strife and decay. It views the prospect of a strong China exercising influence in economic, cultural, political and military affairs not as an unnatural challenge to the world order but rather as a return to normality. Americans need not agree with every aspect of the Chinese analysis to understand that lecturing a country with a history of millennia about its need to ‘grow up’ and behave ‘responsibly’ can be needlessly grating.” Earlier in the piece Kissinger talked about US “apprehensions” about a Sinocentric Asian bloc.” He also pointed out that some American analysts fear the “inherently brittle” nature of authoritarian regimes. On the other side of the fence, the Chinese might see, according to Kissinger, “the United States as a wounded super power determined to thwart the rise of any challenger, of which China is the most credible.” You marriage counselors have seen this before, two head strong clients, carrying historical baggage, and conflicting narratives about the ensuing conflicts that developed between them.